A homogenous distributed database system is a network of two or more Oracle Databases that reside on one or more systems. 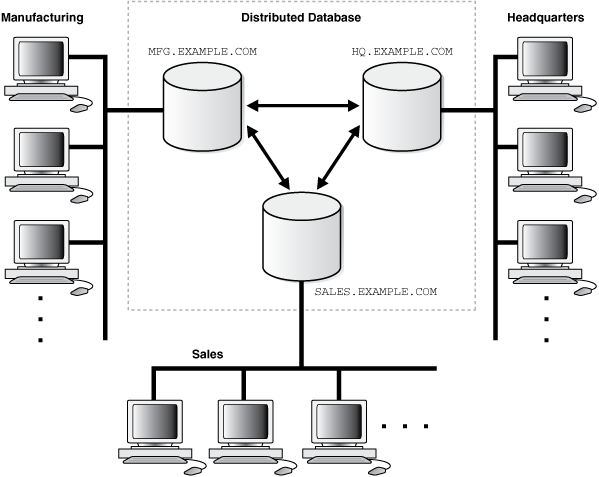 Figure 31-1 illustrates a distributed system that connects three databases: hq, mfg, and sales. An application can simultaneously access or modify the data in several databases in a single distributed environment. For example, a single query from a Manufacturing client on local database mfg can retrieve joined data from the products table on the local database and the dept table on the remote hq database. Connected user link Users connect as themselves, which means that they must have an account on the remote database with the same user name and password as their account on the local database. Fixed user link Users connect using the user name and password referenced in the link. For example, if Jane uses a fixed user link that connects to the hq database with the user name and password scott/password, then she connects as scott, Jane has all the privileges in hq granted to scott directly, and all the default roles that scott has been granted in the hq database. Typically, a database link has the same name as the global database name of the remote database that it references. For example, if the global database name of a database is sales.us.example.com, then the database link is also called sales.us.example.com. A benefit of a fixed user link is that it connects a user in a primary database to a remote database with the security context of the user specified in the connect string. For example, local user joe can create a public database link in joe's schema that specifies the fixed user scott with password password. If jane uses the fixed user link in a query, then jane is the user on the local database, but she connects to the remote database as scott/password. Some types of external authentication for users and roles including Kerberos version 5 for connected user links. A remote transaction contains only statements that access a single remote node. A distributed transaction contains statements that access multiple nodes. In this case, both the database name (prod1) and domain components (us.example.com) are specified, so the database searches for private, public, and global database links. The database searches only for links that match the specified global database name. Global name changes can affect views, synonyms, and procedures that reference remote data using partial global object names. If the global name of the referenced database changes, views and procedures may try to reference a nonexistent or incorrect database. 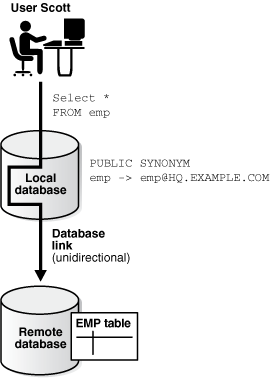 However, synonyms do not expand database link names at run time, so they do not change. The Oracle Database distributed database architecture also provides query, update, and transaction transparency. For example, standard SQL statements such as SELECT, INSERT, UPDATE, and DELETE work just as they do in a non-distributed database environment. Additionally, applications control transactions using the standard SQL statements COMMIT, SAVEPOINT, and ROLLBACK. There is no requirement for complex programming or other special operations to provide distributed transaction control. In a client/server environment, set the client character set to be the same as or a subset of the Oracle Database server character set, as illustrated in Figure 31-6. In a heterogeneous environment, the globalization support parameter settings of the client, the transparent gateway, and the non-Oracle Database data source should be either the same or a subset of the database server character set as illustrated in Figure 31-8. Transparent gateways have full globalization support.